Slow Windows 8 Modern UI app startup times resolved! Had an infuriating bug bite me recently, on my primary Windows 8 Pro 64 bit system. Get this. Desktop apps ran fine, including those that access the web, such as browsers. Very fast, quick start-up times, instantly online. Helped by a fast SSD like my 256GB OCZ Vertex 4. Here's the twist. Running a "Modern" (aka Metro) app that accessed the web, and, well, ouch! It'd take about 10-15 seconds, just to start-up and connect to the web. Yep, rendering them completely useless to me. Even goofier, using Remote Desktop to get in to this same workstation, and Modern UI apps came right up, instant web access. How strange is that? Yep, that points to a video driver interaction of some sort. But what exactly do I do about this? So I was able to refine my Google searching. Tada, a simple and effective fix. Fantastic, the best kind! Only 2 hits on Google at this time for me to credit, both thanks to one person named "slowturn." Thank you "slowturn", over on Windows Eight Forums! 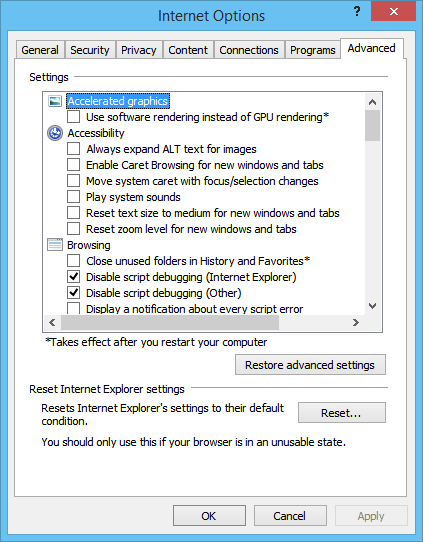 Yep, it's that simple, just turn off Accelerated Graphics in IE 10 settings. Yep, strange. But this workaround works! Here's the thing. It turns out that folks with a DisplayLink monitor as part of their multiple monitor setup can be affected by this odd behavior. So it's really just a strange interaction with DisplayLink drivers, perhaps only the current 7.1 M1 release from Feb. 01 2013. Once new drivers are released, I'll see if I can turn that IE 10 setting back on again. I'm sure glad this issue is fixed for me, and now with Stardock's ModernMix, my fast Modern UI apps are far more practical on my triple monitor desktop these past 2 weeks. See also TinkerTry.com/mydesk. DisplayLink drivers are now up to 7.5, and I'm on Windows 8.1. With IE11 configured with Accelerated Graphics at defaults (GPU rendering), no worries, works fine, even those Modern UI apps.